The event was marketed as saying "Would you like to try on a Hijab or learn why Muslim women wear the headscarf? Come along to our walk-in event. Free scarfs for all those that choose to wear it for the day or part of the day. Muslim women, along with followers of many other religions, choose to wear the Hijab. Many find liberation, respect and security through wearing it. 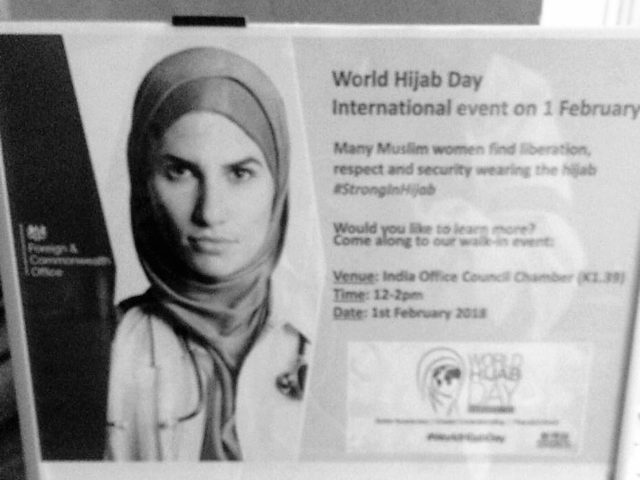 #StrongInHijab. Join us for #WorldHijabDay." The Hijab is increasingly been seen as a highly political symbol with Western Governments seen as keen to promote it's wearing and use. This is unlike in Iran where female protestors have removed the Hijab as an act of defiance against the ruling Islamic regime and face arrest and imprisonment for doing so. Read: "SHOCKING: EU ready to punish Britain during Brexit transition"
Read: "RAF jets scrambled to intercept RUSSIAN BOMBERS heading to BRITAIN"